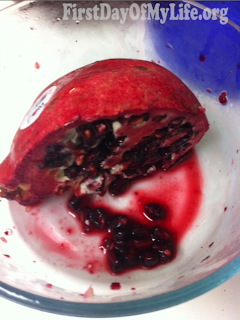 Am I the only one who has issues eating a pomegranate? That leaves what looks like a small murder scene in the kitchen? But I have been so accustomed to doing it the messy way. I do the under water method, not a bit of mess! So funny you posted this bc the other night at the grocery store I contemplated buying one and thought with me and my skills in the kitchen, I would somehow ruin the pomegranate. Lol. You're so cute. I love pomegranate! But I never buy fresh, sadly because of the mess! What's the secret? !